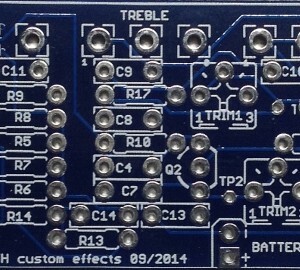 PCBs based on runoffgroove circuits purchased from TH custom effects are intended for DIY / non-commercial use only. Any commercial use whatsoever is forbidden. With this latest version of the Umble board, Thomas has given us the full, original ROG schematic. It’s a winner! There’s a huge amount of gain available (too much for some), but it’s controllable. ROG themselves suggest adding a switch to lift the Capacitor (C5) on the source of Q1 (and/or Q2) from ground to give a low-gain option. On a footswitch this might give a useful boost option, and it would be easy to do with this board. The tone stack is a bit odd – that’s how it works on the full-sized amps, apparently. There are some lovely sounds available, right from soft, smooth overdrive to some pretty over-the-top, almost fuzz sounds, which I doubt were a feature of the original! Biasing all four FETS is made much easier by the inclusion of test points on the board. It all fits easily in a 1590B on its side with the controls in a logical line across the top. 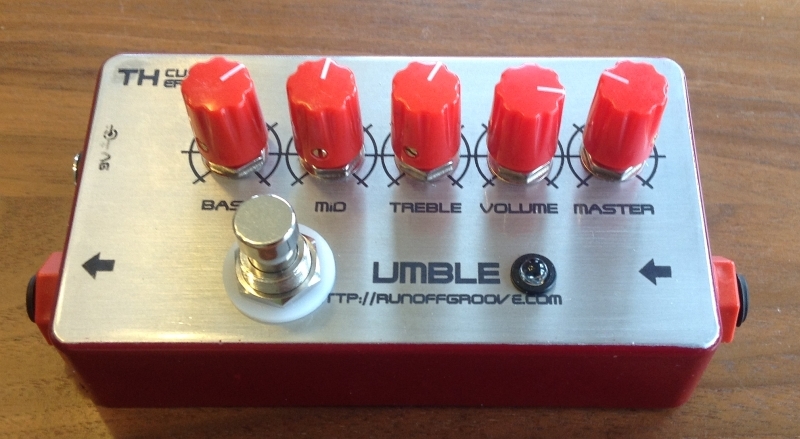 I can thoroughly recommend this version of the Umble board. SMT MMBFJ201 pads are on the back of the PCB! No need to waste your SMT adapter/break-out boards on this build if you don’t have a stash of TO-92 J201’s on hand… Did I mention it sounds great, too?